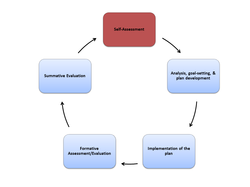 The first step in the cycle is self-assessment and goal proposal. The key actions in this step are for educators to analyze student data, reflect on their performance, think about school priorities, and then propose a minimum of one student learning goal and one professional practice goal individually and/or in teams. The regulations on evaluation require that each educator is responsible for gathering and providing to the evaluator a summary of his/her self-assessment. This must include: (1) an analysis of student learning, growth, and achievement for students under an educator’s responsibility (2) assessment of practice against Performance Standards and (3) proposed goals to improve practice and student learning, growth and achievement. Educators enter this summary into the online system. Educators' self-assessment and goal-proposal should be completed and entered into the system by October 1.